Tufts scientists reported the first U.S. case of human B. miyamotoi infection earlier this year. Photo: Kelvin Ma. Under the microscope, Sam Telford surveyed the tiny, spiral bacteria floating in spinal fluid taken from an 80-year-old woman. They looked very similar to the spirochete bacteria that can cause Lyme disease. But in fact, he had discovered yet another public health threat—a new disease that people can get from the same ticks that transmit the Lyme bacteria. When technicians at a commercial diagnostic laboratory saw the mysterious spiral bacteria, they sent the sample to Telford, whose laboratory serves as a reference center for unusual zoonotic infections, that is, those that pass between animals and humans. Telford and Heidi Goethert, J93, a microbiologist at the Cummings School, sequenced the spirochete DNA, and identified it as Borrelia miyamotoi, which was first found in ticks in Japan in 1995 and is closely related to the bug that causes Lyme disease. Previous cases of B. miyamotoi infections in people had been identified in Russia in 2011. The B. miyamotoi bacteria may be an under-recognized source of human disease, especially in such regions as the northeastern United States, where Lyme disease is prevalent, say Telford and his coauthors. There’s been lingering disagreement in the scientific and medical communities about whether a person can test negative for Lyme and still have Lyme, says Telford. This latest research raises the question of whether patients with atypical Lyme disease—those who have symptoms but whose blood doesn’t test positive for Lyme—may actually be infected with B. miyamotoi, he says. Both are treated with the same course of antibiotics. 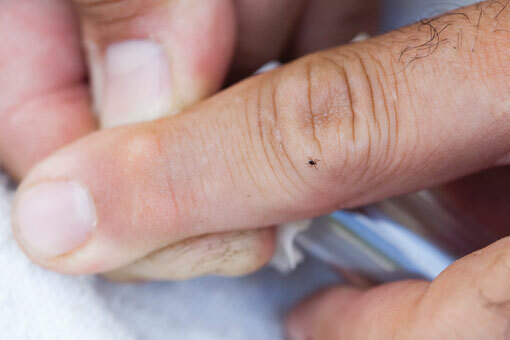 Not all deer ticks carry B. miyamotoi, just as they don’t all carry the Lyme-causing bacteria. Previous assessments of tick populations suggest the new bacterium appears to be much less common—roughly 10 percent as prevalent—than the one that causes Lyme, according to Telford. While to date there has been just one confirmed case of human B. miyamotoi infection in the United States, researchers have known for some time that the ticks carry these bacteria. Telford suspects that people were being infected, but there wasn’t proof until the New Jersey woman was diagnosed. This latest tick-carried disease, which has yet to be named, is the fifth known human infection to come from deer ticks in the Northeast, after Lyme, babesiosis, ehrlichiosis and deer tick virus. Ticks are notorious transmitters of infectious disease around the globe. Their indiscriminate dining habits (they don’t seem to care what animals they feed on) and the relatively large amount of blood they consume (200 times their own body weight) make them particularly adept at picking up pathogens and then spreading them. “Lyme disease alone is enough of an argument to take action to reduce risks, let alone four other [tick-caused] infections,” says Telford. “In some New England communities, as many as a third of residents have been exposed to at least one tick-borne infection,” says Telford, who suggests that public education about tick-borne diseases and reducing deer herds, while controversial, may be a good places to start.